12/03/2018 – This year´s grape wine harvest has produced truly exceptional qualities across the nation. 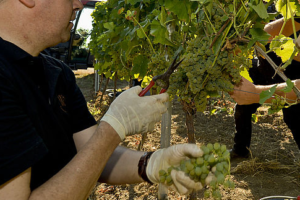 At the time of writing, many Rhineland-Pfalz winegrowers are still hoping for a successful ice wine harvest, which was virtually non-existent last year, and have left grapes hanging on 532 hectares of vines for this noble-sweet speciality. The rainy days in the Ahr this summer could be counted on the fingers of one hand. Fortunately, there had been ample precipitation in January and February, which – at 120 l/m2 – replenished the water supplies. From mid-March temperatures rose, leading to a very early flowering of the vines from 25 May. From then on, there was no rain worth mentioning until 23 September. The summer however was not quite as hot as in the comparable year 2003; temperatures of 40° Celsius were not reached. The vines coped better than expected with the long summer drought – only some vineyards with young vines required irrigation. The advantage of the very hot and dry conditions was the almost complete absence of diseases such as oidium and peronospera. The Japanese cherry vinegar fly dreaded above all by red wine producers also caused no damage. Exceptionally healthy, albeit small berries with must weights of 94 degrees Oechsle were harvested; even levels of 120 degrees were not uncommon. The vines had produced a large crop, so that yields for example of 90 hl/ha for Spätburgunder (Pinot Noir) were higher than expected. The harvest took place three weeks earlier than on average, beginning in mid-August and ending on 15 October. The vines achieved “a sugar content of unprecedented proportions”, enthused Reinhold Kurth of the Ahr Winegrowers´ Association. Acidity levels however were lower than normal. The total harvest volume is estimated at 55,000 hectolitres – in 2017 there had only been 38,000 hectolitres. Baden is Germany´s warmest wine region. Perhaps the vines there were better adapted to the extreme weather conditions of last year, as flowering came sooner than ever after budbreak – after only 30 days -, beginning on 25 May and thus 14 days earlier than usual. Even April was the warmest on record, and that was not to remain the only record. The Siebenschläfertag on 27 June (lit. : Seven Sleepers´ Day) lived up to its name, initiating a further hot spell that lasted more than seven weeks with temperatures close to 40° Celsius. Most vines however coped well with the drought, producing a large crop of healthy berries which ripened quickly. Only the young vines needed to be irrigated as their roots were not yet long enough to reach the lower water tables. Picking began at the end of August and proceeded quietly, without stress, as there was almost no disease pressure. The estimated harvest volume of 1.55 million hectolitres – at an average of 90 – 95 hl/ha – is almost 30 percent higher than the long-term mean. But the fact that the grape quality was so high with such an above-average yield had, according to the Baden Winegrowers´ Association, “never happened before”. The wines are fruit-driven, powerful and structured due to the high sugar content of the grapes, resulting in a vintage with more power than the 2017s. But perhaps the icing on the cake is that in some vineyards grapes could even be harvested for high-quality sweet wines. The Franken winegrowers also witnessed an early flowering and a fast ripening in a very hot and dry season. The isolated rainfall or thunderstorm was not sufficient to replenish the water reserves in the ground. In some steep sites the ground heated up to 60° Celsius. “Drip irrigation for the young vines, which still need a few years for their roots to reach down to the water, has become standard practice – of course precisely tuned so as not to pamper them,“ explains Iphofen winegrower Hans Wirsching. That means a lot of work as many kilometres of tubing have to be laid. A vine receives up to 40 litres of water over several hours, applied very precisely to avoid evaporation loss. To help curb the fast pace of grape ripening and ensuing sugar production with temperatures sometimes rising to 38° or 39° Celsius, growers often removed a large number of leaves from the vine. All too heavy wines, such as those resulting from the exceptionally warm vintage 2003, are far less in demand nowadays. The wines will be “a delight to drink”, producers promise their customers, a little more powerful than the 2017 vintage but still full of finesse. Progress has definitely been made on how best to adapt to climate change. “A delight” by the way also applies to the quantities, which – at approx. 523,000 hl – are expected to be 20 percent up on the previous year. Good times for Franken wine fans. When it comes to the weather, the Hessische Bergstraße is regarded as spoiled, as here – in Germany´s smallest wine region -, spring comes sooner than elsewhere. One can therefore reasonably expect all to be well in a hot and dry growing season such as 2018. But here as well growers had to take care to prevent the wines from becoming too heavy. Average must weights of approx. 86 degrees Oechsle at the region´s largest producer, the Bergsträßer Winzer cooperative in Heppenheim, are therefore very promising and stand for a very high quality for this region. However, top must weights of over 100 degrees Oechsle were also not uncommon. The autumn proceeded in a very relaxed fashion with ideal harvest weather of warm, dry days and cool nights. With no disease pressure, the grapes were able to develop plenty of aroma, even though the harvest had begun on 15 August and thus earlier than ever before. It turned out that the extreme water shortage did not affect the majority of grapes thanks to the vines´ deep roots. As far as Reinhard Antes, chairman of the Bergsträßer Winzer, is concerned, 2018 is “perhaps the best vintage of the last 15 years”. Harvest volumes in the region are estimated at 42,000 hectolitres, 45 percent up on the previous year. Of all the wine regions, the 2018 growing season rewarded the Mittelrhein with the highest volume increase. At an estimated 46,000 hectolitres, the crop was 64 percent above the 2017 total (28,000 hl). It is therefore not surprising that the winegrowers are highly satisfied, especially as their cellars were mostly depleted of stocks. The dry summer lasted from April to September. Hopes for a steady rainfall had not materialized but fortunately hail damage and heavy rain also remained at bay. Even the Rhine reported low water levels. However, drought stress occurred in only a few isolated cases in young or low-lying vineyards. Towards the end of ripening, vine development was almost three weeks ahead. By means of precise leaf removal in the vineyard, growers were able to control the all too vigorous plant growth, but due to the low humidity there was almost no disease risk, which made things somewhat easier. The grapes obtained on average a perfect 88 degrees Oechsle and 8 g/l of acidity, with excellent results also achieved with the red wines. The harvest proceeded on the whole in a leisurely fashion. “Even the oldest growers can barely remember having harvested so many grapes with such excellent quality and in such a perfect state of health”, the Mittelrhein Winegrowers´ Association reported and forecasts “exciting tastings offering plenty of enjoyment”. In 2018 the grapes in the Nahe were ripe sooner than usual and the harvest had already begun at the end of August. However especially for the high-quality wines, some growers delayed picking the later-ripening varieties until October in order to promote grape phenolic maturity. This was made possible by the very hot and dry summer with optimal autumn weather – a “super summer” was how Winegrowers´ Association president Thomas Höfer described it. The wait was also possible because problems such as rot, mildew or animal pests were virtually non-existent. Perfectly ripe and completely healthy grapes with must weights that not infrequently reached 100 degrees Oechsle were the reward and basis for excellent wines. They very nicely reflect the diverse and typical terroir of the Nahe region. With must volumes of 440,000 hectolitres, the crop came in at 40 percent above the long-term average. An excellent and long-awaited compensation for the two previous, much smaller harvests of 2017 and 2016. For Winegrowers´ Association president it was: “An absolutely exceptional year”. Such exceptions the wine lover will be sure to value. When the going is good, it is very, very good. This saying fits the 2018 vintage in the Pfalz. Hardly any damage despite extreme summer temperatures and drought, almost no water catastrophes, perfectly healthy grape material in abundant quantities, fantastic harvest weather with noble-sweet nectars as the crowning achievement. It can hardly get better. It is therefore no surprise that the representatives of the Winegrowers´ Association were nothing short of euphoric. “Unique” or “almost too good to be true”, was the verdict even of the experts. The record-breaking warm weather period had already begun in April, leading to an early flowering of Riesling at the end of May. In this merry month there was also quite a bit of rain but unfortunately also some hail in the south of the region. The true heatwave then came in July and August. Picking for the first Federweißer (a partially-fermented, yeasty grape speciality) had already begun in August, with the main harvest following two weeks later and thus earlier than ever before. September recorded ideal, largely dry and settled weather conditions, with especially the red varieties profiting from the extended hang time to give intensely-coloured, full-bodied wines, not only in the case of Spätburgunder (Pinot Noir). The white wines have moderate acidity, while the alcohol levels also remained relatively moderate – surprising even for many growers given the amount of sunshine. Growers are delighted with the estimated yield of 2.5 million hectolitres, 17 percent above the long-term average. After years of small harvests it feels so good”, explains Winegrowers´ Association president Reinhold Hörner, “when we can once again meet the demands of the market with no limitations”. With the onset of “golden October” in the Rheingau, many winegrowers had just about finished picking. This year they had begun four weeks earlier than usual thanks to the hot summer 2018, which did not quite reach the highs of 2003 but nonetheless beat previous records of the last century of 1947, 1994 and 1976. The drought, which incidentally caused relatively few problems in most vineyards, prevented infestations from fungus diseases and the dreaded cherry vinegar fly. “It was simply too hot for the pests,“ explains viticultural consultant Berthold Fuchs. Extensive irrigation support was however necessary for the young vines. Indeed drought-stress posed the greatest threat for wine quality but the vines still produced an abundant number of clusters, resulting in a large harvest volume estimated at 285,000 hectolitres compared with 210,000 hectolitres the previous year. Fortunately the quantity of the 2018 vintage also kept pace with the quality, which is excellent thanks to the perfect health and maturity of the grapes. “An outstanding vintage”, said viticultural consultant Berthold Fuchs. This applies not only to Riesling but also to the region´s Spätburgunder (Pinot Noir), which is proving to be particularly intensely-coloured and concentrated. 90° Oechsle for the first Federweißer already on 6 August? That had never happened before in Germany´s largest wine region. A very early flowering thanks to the warmest April on record led to expectations of an early harvest. However the hot and dry, sunny summer served as an additional ripening accelerator. The very favourable, settled weather conditions continued into the harvest, allowing many grapes to stay on the vine right up to October and partly even to November. Of course the drought did present major challenges for growers in some locations and the steeper vineyards especially had to be partly irrigated. However, the Rheinhessen growers were overall pleasantly surprised with the performance of their vines. The harvest volume estimated at 2.95 million hectolitres is almost 20 percent higher than the long-term average. A growing season like 2018 is ideal especially for red wines because the grapes changed colour very early and benefitted from the extended hang time. But also the 2018 white wines in Rheinhessen will be rich in aromas, varietally typical and fruity with moderate acidity levels. Numerous noble-sweet specialities are also available. In view of the Rheinhessen Weinwirtschaftsrat (trade advisory body): “This great vintage was unexpected but will be remembered for a long time”. Wine lovers can already look forward to the results. This year even in Sachsen almost all the area under vine had been harvested by the beginning of October, the exception being a number of Traminer and Riesling sites which were still waiting for Auslese must weights. For the growers, the summer was partly very labour-intensive as many vineyards had to be irrigated, not least because of the wealth of steep sites within the region. At an estimated 56.5 hectolitres, the yield was on average the second highest since 2000. According to the latest estimates, approx. 22,500 hectolitres of must were obtained, 7 percent more than the average of the last ten years. However, even at these levels Sachsen wines are still a rarity when compared with other regions. Because the grapes were smaller than usual due to the drought in the autumn, the juice was more concentrated, which accounted for the correspondingly good must weights. And the principle “quality over quantity” is the rule in Sachsen anyway. “Wines with a marked fruitiness are to be expected. This year will be remembered for a long time,” is the view in Sachsen winegrower circles. Moreover, by Sachsen standards the wines will be relatively powerful. Winegrowers on the Elbe have already reacted to climate change and are cultivating new varieties such as Chardonnay and Sauvignon Blanc. In 2018 not only these will show their true potential. High must weights are not a problem for regions like Wurttemberg where red wine accounts for almost 70 percent of the production – after all red wines may have a little more power. One can therefore look all the more forward to the 2018 vintage. Healthy red grapes with must weights often above 100 degrees Oechsle were harvested unusually early but without any haste or stress, resulting in richly aromatic, deeply-fruited wines with an excellent structure. Only the white varieties had to be picked relatively quickly. 80 percent of the wines fall into the “Prädikat” (ie. superior) category, even Beerenaulese grapes with must weights of around 250 degrees Oechsle were harvested. Hardly any drought damage was reported as fortunately there had been two good falls of rain, however the Ludwigsburg area also had some hail. Hermann Hohl, president of the Württemberg Winegrowers´ Association, was “completely satisfied” with the vintage. The ideal harvest weather allowed everyone to relax. The growers did not have to “chase after every last degree of Oechsle”, he said. Volume estimates of 1.2 million hectolitres represent a welcome increase on last year´s figures. “The consumer can look forward to top qualities at affordable prices,” the Association announced.